UGH! DAMNIT! I don’t really know how else to sum up my morning other than to ask to start over. We planned to go to Target today to get a super deal on some Pantene. No I don’t usually buy Pantene shampoo, but it’s on sale and with the coupons it was going to be a killer deal (or so I read on-line). So we load up and head out. It’s about 23 miles to Target so it’s not just a quick jaunt. But we needed a birthday present for our neighbor so we decided it was worth the trip. And as I mentioned yesterday, I needed my coffee fix. We get about half-way when the Big One starts whining about having to go potty. Did I not ask her 10 times before we left the house? UGH! Being the good mom that I am, I tell her she’s going to have to wait until we get to Target. We make it to Target, doing the potty dance and whining we get to the restrooms and apparently stage-fright set in or something. She sat on the pot and sat on the pot and sat on the pot. Meanwhile, the Little One is foraging through my purse for food. Yes she loves to eat in the restroom. I threaten the Big One with two minutes to pee or we were moving on. So she finally pees. We head into the shopping adventure. Almost immediately the Little One is screeching and trying to escape from the confines of the cart (who taught that kid how to walk?). I bribe her with graham crackers to stay seated while we head to the shampoo aisle. We get there and I reach in my purse to double check the coupon and get the deal right. Where in the heck are my coupons???? FART! I forgot the freaking coupons. Good Lord is this really happening? By now I am out of graham crackers and the Little One is screaming while the Big One starts doing the potty dance again. It’s been all of 7 minutes or so, she cannot have to pee again. I ask her 10 times do you really have to go? Yes, mommy…. Yes, mommy… Yes, mommy. … So I say fine let’s go, but tell her she had darn well better pee or she was going to be in trouble. All I wanted to do was get something for the 5-year-old across the street and get out of the store. As we go towards the restrooms, the Big One stops and says, “I don’t really haf to go.” UGH! I grabbed some paint and paint brushes. Everybody likes to paint, right? I figure I’ll get a gift receipt and they can return it if he doesn’t paint. So we get to the check-out, by way of the graham cracker aisle. Yes, I have about 10 packages of them at home, but 23 miles is a long drive home with a screaming 16-month old. As I am trying to pay, the Little One saw the graham crackers on the belt so she is now trying to climb out of the cart onto the belt to get the box. While the Big One is asking the cashier if she can hold everything without it being in a bag. I am just trying to get my credit card out to scan and be done with it. Finally the cashier finishes ringing us up, I sign my life away and then realize I forgot to ask for a gift receipt. In desperation, I look at Danielle the cashier and ask, is there any way to get a gift receipt now. “NOPE… too late,” she says and smirks. UGH! Now I know we are going to Starbucks so that I can make it through the day. It’s only 10:30 a.m. caffeine and sugar are the only things that will get me through it. We get a frappuccino for me and an apple juice for the Big One (yes she is addicted already). And head home. We get home rather uneventfully and unload the Target goodies. I turn Dora on for the Big One and proceed to make lunch for the Little One. Then it happened…I’m not sure how it happened, but really what did I expect with the way the morning went? 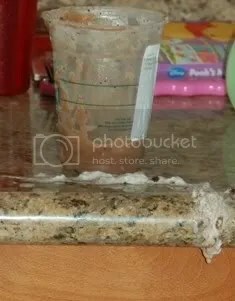 My $4 Starbucks fix somehow slipped out of my hand, the lid flew off and frappuccino goodness went all over my kitchen. I said some not-so-nice words which of course brought both kids into the kitchen to see what happened. While the Little One immediately started trying to scoop it up and put it in her mouth, the Big One starts screaming and freaking out saying, “OH NO! That’s my drawer!! OH NO! That’s my drawer!” While I was mourning the loss of my beverage the Big One was freaking out because I defiled “her cabinet” (where the girls’ dishes, silverware, etc are stored). Is that not the saddest sight ever??? So today, my friends, I ask you again to make the ultimate sacrifice for me. 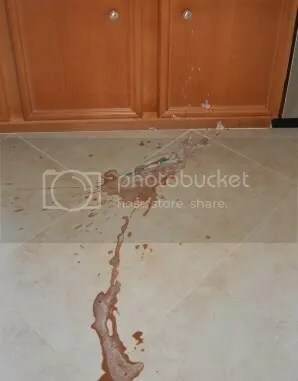 Go to Starbucks and enjoy some frappuccino goodness in honor of me and my spilled java chip fix. ← Anybody Know a Remedy? I feel so sad for you! That is just not the way to start your day, especially a Friday! I know it’s not a Frap, but I got some got something special for you over on my blog!